Mr Willcock was stopped on December 7 1950 while driving his car along Ballard's Lane by uniformed police constable Harold Muckle, who demanded to see the motorist's identity card. Mr Willcock refused. Pc Muckle told him to produce the compulsory card at the local station with 48 hours. "I will not produce it at any police station," Mr Willcock replied. 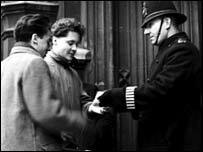 With this act of defiance, Mr Willcock brought crashing down a giant bureaucracy which had, since the outbreak of World War II in 1939, forced an identity card on every civilian in the UK - man, woman and child. When Willcock v Muckle eventually reached the High Court in 1951, Lord Chief Justice Goddard said the continuation of the wartime ID card scheme was an "annoyance" to much of the public and "tended to turn law-abiding subjects into law breakers". Mr Willcock was sent on his way. With Home Secretary David Blunkett this week stressing the advantages of reintroducing a compulsory identification card, Lord Goddard's judgement that the wartime system was a cause of public "resentment" may again be cited by critics of the idea. But, Mr Willcock aside, were wartime ID cards so very unpopular? 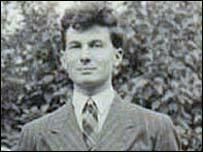 "I don't think anybody had any objections," says Geoffrey Styles, who was issued with his card as a schoolboy in 1939. "There was a great fear of invasion. I remember my father was decorating the house and my mother asked why he was bothering: 'The Germans will be here soon'." The ID cards - few of which contained a photograph of the holder - were most commonly used in conjunction with a ration card, so that civilians could claim their allowances of food and other goods. "It was rationing that people minded more that the ID cards. I never felt that I was being monitored or that Big Brother was watching me," says Mr Styles. He also says that in his tight-knit east London community, everybody knew everybody else, making the carrying of ID cards slightly redundant. "My ID card eventually went into a drawer. I can't ever remember being asked to show it." Former government minister Tony Benn - a critic of Mr Blunkett's new ID card plans - agrees that the wartime "atmosphere" made the public more accepting of the curtailing of civil liberties. "During wartime it is a bit like living in a police state." However, unlike modern ID cards which could, theoretically, carry electronic data the holder cannot themselves see or retrieve, Mr Benn says the wartime documents were "just a little bit of paper and very simple, carrying just your name and address". The simplicity of these cards - while perhaps making them more palatable to those forced to carry them - was also a factor undermining the continued implementation of a national ID system. The cards were presumably a laughable hurdle to the forgers employed by the Nazis in Germany or blackmarketeers at home. Indeed, the failings of the ID system allowed many thousands of military deserters to roam the UK, according to a new book, An Underworld at War, by Donald Thomas. However, it might not have been concerns about security shortcomings, civil liberties or Clarence Willcock which prompted Winston Churchill's 1952 government to end ID cards. The system was expensive and difficult to administer, and offered few benefits. "Let us have the credit for 'setting the people free'," wrote one Treasury minister in 1952, though he was really gleefully looking forward to "the consequential staff economies". The demise of the system was forecast while the fight against Hitler was still fierce. In October 1944, Registrar General Sir Earnest Holderness said that he did "not believe that public opinion will stand for the retention of [national registration] in its present form". "In peace time, the records would probably have to be checked by some annual or periodical canvass," he said, clearly not savouring such a task.